If you have enjoyed a LWLW event close to your home, why not “Pass it on“. 8th October 2016: A great night for the 6th “Ware’s Got Talent” free community show. Read the Hertfordshire Mercury’s article here. 2015-2016: It is a great privilege to have been selected as one of Ware Mayor Phyllis Ballams’s supported charities this year. We thank her and all of the supporters for their generosity in helping to fund our community activities. July 2014: We are excited to announce the date for this year’s “Ware’s Got Talent” event, to be held on 31/10/14. Open to all ages, application is now open. Click here for more. June 2014: our outgoing chair, Alison Jackson, has now become Rev. Alison Jackson and is now serving at St Cuthbert’s in Hoddesdon. The LWLW team thank her for her pioneering work, and pray for her as she begins this new adventure. May 2014: An estimated 3% of Ware’s population enjoyed our free community fun day at the King George Field: cafe, craft, bouncy-castle, BBQ, games. All free. August 2013: You can now enter for the 2013 “Ware’s Got Talent” Event (now in it’s fourth year) by clicking here. May 2013: Alison Jackson, chair of the LoveWare:LiveWare committee receives Royal recognition (read more here). 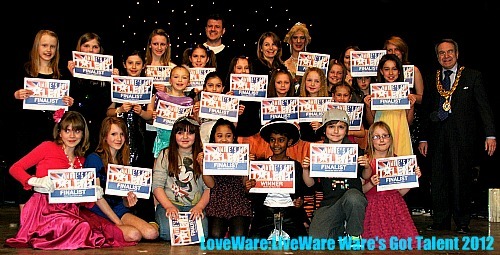 10th February 2012: Congratulations to all of the finalists in the 2012 Ware’s Got Talent event, presented by LoveWare:LiveWare. The 2012 winner, in front of a packed hall at Chauncy School, was dancer Joel Israel. Thank you to judges Nicola Lander, Craig Berry and Alan Warman. Both Joel, and fellow finalist, street-dancer Mack Isaacs, have been invited by the Mayor, Alan Warman, to perform at his upcoming civic dinner. November 2011: LW:LW has been awarded a certificate by the Royal Horticultural Society under the category “It’s your Neighbourhood“, in recognition for all the work that we do on the King George Playing Fields.